NOTRE DAME, Ind. — Scoring in five of its seven innings at the plate, No. 8 Florida State (40-9, 17-2) took game one of the series with Notre Dame (30-19, 12-9 ACC) by a score of 9-2 on Friday night at Melissa Cook Stadium. 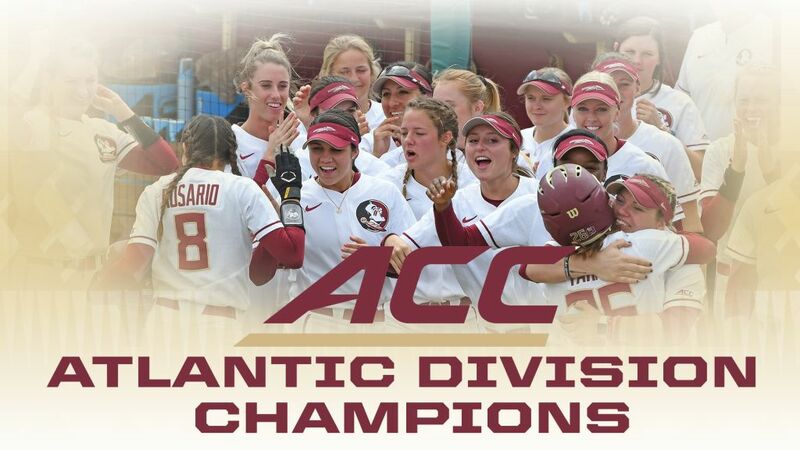 With FSU’s win, along with the Boston College 4-2 loss at Louisville, the Seminoles improve to 17-2 in conference play and clinch the first-ever ACC Atlantic Division title. Florida State can secure the overall 2018 ACC regular season championship with one more conference win in its final five ACC games this season. It also marks the 31st 40-win season in FSU history and the ninth time in Lonni Alameda’s 10 years as head coach at Florida State. Florida State opened the scoring in the top of the first inning as the Seminoles loaded the bases with nobody outs on walks to Jessie Warren and Carsyn Gordon, along with a single up the middle by Sydney Sherrill. Cali Harrod drove in her 24th RBI of the season on a groundout to third to give the Noles a 1-0 lead. The Seminoles scored three runs in the top of the second, all with two outs, to make it a 4-0 game. Morgan Klaevemann drew a walk and stole second for the 121st SB of her career. Warren hit a ground ball toward short, and it went through the legs of ND’s Morgan Reed, extending the inning and allowing Klaevemann to score. Gordon followed with a single up the middle and Sherrill walked on four pitches to load the bases for the second-straight inning. Zoe Casas knocked a 2-1 pitch back up the middle to drive in two runs and make it 4-0 FSU. Elizabeth Mason led off the Seminole third inning with a single to right center and quickly stole second. A single by Cassidy Davis hit the third base bag and the runners ended up on second and third on the play. Anna Shelnutt followed with a groundout to second and Mason was also retired at the plate for a double play. The inning continued with a pinch-hit walk by Mackenzie Puckett, extending her perfect offensive production as the freshman has drawn a walk in all four plate appearances this season. Klaevemann re-entered at first and a wild pitch moved her and Davis up to second and third with two outs. Warren brought them both in on a single to left for her 250th career RBI, which ranks 16th in NCAA history. Kylee Hanson did not allow a base hit to Notre Dame until the top of the third inning on a leadoff double by Alexis Holloway. A strikeout and a single put Irish runners on the corners with one out. FSU’s Mason made an impressive sliding catch in foul territory down the right field line for out number two and fired home, but the throw was not in time as the Irish cut it to 6-1 on the sacrifice fly. Hanson ended the inning with a groundout to third. Savanna Copeland entered the game to pitch for the Noles to start the bottom of the fifth, ending Hanson’s day in the circle. The senior improved to 24-3 on the season, tossing 4.0 innings and allowing just one run on two hits with two walks and four strikeouts. Copeland allowed a leadoff walk in the ND fifth inning, but induced a double play to the next batter and kept the inning scoreless with a groundout to third base. Florida State added two more runs in the top of the sixth inning as Sherrill led off with her third walk of the game and stole second base. Casas hit a single up the middle to put runners on the corners with nobody out. Harrod grounded out to the circle for out number one, but Sherrill was able to score from third on the play to make it 7-1 FSU. Mason hit an RBI double to right, but got caught in between second and third for out number two. Davis hit a single to right and was pinch run for by Korina Rosario. Rosario stole second but would be left stranded as a pop out ended the inning. ND’s Abby Sweet led off the sixth inning with a double, and an RBI single by Reed brought in the second run of the game for the Irish. Back-to-back walks and a single loaded the bases with one out and Davis entered to pitch for the Seminoles. The sophomore got the Noles out of the inning with their second double play of the game as a groundball to third base was grabbed by Sherrill and she stepped on the bag, and tagged the runner that tried to get back to the base. The Noles closed out the scoring with a lone run in the top of the seventh as Klaevemann started the inning with an infield single. She later stole second for FSU’s seventh SB of the game and scored on a two-out batted ball by Casas to second base that was misplayed, giving FSU the 9-2 final score. Davis pitched around a lone hit in the bottom of the seventh to secure the win. She gave up just one hit in her 1.2 innings without giving up a run or a walk, with one strikeout. Copeland allowed three hits, one run and three walks in 1.1 innings of relief. Florida State and Notre Dame continue their series on Saturday, April 28 with first pitch scheduled for 3:00 p.m. The game will be broadcast on ACC Network Extra and links for the stream, live stats and FSU Softball Radio will be available on the softball schedule page of Seminoles.com.